(Erin Alberty | The Salt Lake Tribune) Fall foliage glows in the afternoon sun Oct. 4, 2017 at the Pando aspen grove in Sevier County. Pando is the largest aspen clone — and most massive living thing — known on earth. (Erin Alberty | The Salt Lake Tribune) A mule deer approaches the Pando aspen clone Oct. 5, 2017 in Sevier County. 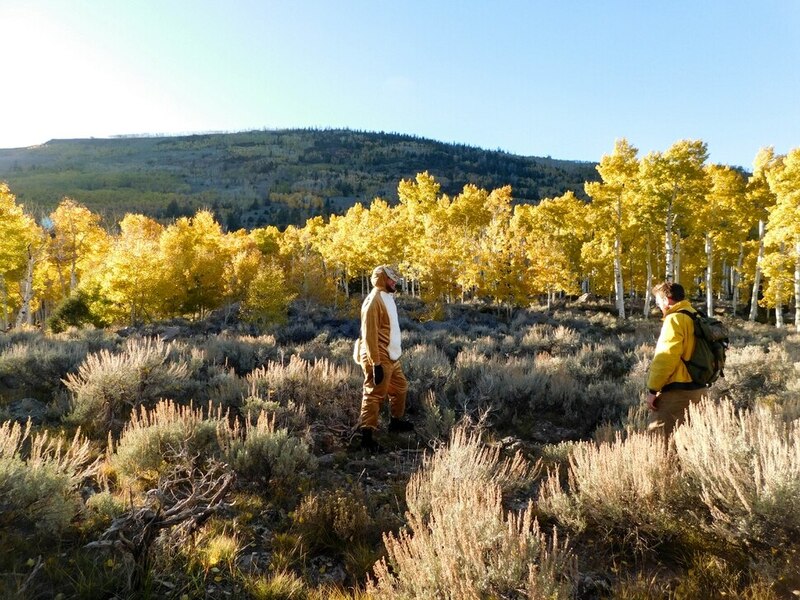 Pando is the largest aspen grove — and most massive living thing — known on earth, but scientists say it could die soon because deer are browsing the clone's new sprouts, preventing it from regenerating. (Erin Alberty | The Salt Lake Tribune) Comedians Brad Einstein and Kyle Niemer perform for a video of comedy sketches about ecology — or silly bits in the woods, as Einstein calls them — on Oct. 5, 2017 at the Pando aspen clone in Sevier County. The team, from Chicago, is producing the video as part of a fundraising campaign for interpretive signs at Pando, the largest aspen grove and most massive living thing known on earth. (Erin Alberty | The Salt Lake Tribune) Comedians Brad Einstein helps Kyle Niemer put on a deer costume to shoot comedy sketches about ecology — or silly bits in the woods, as Einstein calls them — with videographer Dave Thomas on Oct. 5, 2017 at the Pando aspen clone in Sevier County. (Erin Alberty | The Salt Lake Tribune) Scientists have fenced portions of the Pando aspen grove to measure new growth where deer cannot eat young sprouts. In one fenced area, shown here on Oct. 4, 2017, a new layer of aspens can be seen below the mature canopy. (Erin Alberty | The Salt Lake Tribune) Rancher Darren Nelson follows his herd of cattle along Fish Lake on Nov. 6, 2017 in Sevier County. Nelson's herd of 1,100 spends about 10 days each year grazing near, and sometimes in, the Pando aspen clone. (Erin Alberty | The Salt Lake Tribune) Fallen aspen leaves rest like gold coins on the ground Oct. 4, 2017 in the Pando aspen grove in Sevier County. Pando is the largest aspen clone — and most massive living thing — known on earth. (Al Hartmann | The Salt Lake Tribune) Pando, a clonal colony from a single male quaking aspen near Fish Lake, is believed to be the heaviest known organism. Pando is believed to be dying, mostly from deer browsing on young trees. (Al Hartmann | The Salt Lake Tribune) At 106 acres, Pando is the largest known aspen clone, and the most massive living thing known on earth. Its trees are united by a single root system. Scientists say deer are voraciously eating Pando's new sprouts, preventing the clone from regenerating. It could deteriorate beyond recovery in less than 20 years, they warn. Al Hartmann | The Salt Lake Tribune Aspen trees in the Pando clone, an area of over 100 acres of trees that make up the world's largest living organism near Fish Lake in Central Utah. The Pando clone is not regenerating (sprouting small trees), putting its continued existence in question. (Al Hartmann | The Salt Lake Tribune) At 106 acres, Pando is the largest known aspen clone, and the most massive living thing known on earth. Its trees are united by a single root system. Scientists say deer are voraciously eating Pando's new sprouts, preventing the clone from regenerating. It could deteriorate beyond recovery in less than 20 years, they warn. (Al Hartmann | The Salt Lake Tribune) At 106 acres, Pando is the largest known aspen clone, and the most massive living thing known on earth. Its trees are united by a single root system. Scientists say deer are voraciously eating Pando's new sprouts, preventing the clone from regenerating. It could deteriorate beyond recovery in less than 20 years, they warn. (Al Hartmann | The Salt Lake Tribune) At 106 acres, Pando is the largest known aspen clone, and the most massive living thing known on earth. Its trees are united by a single root system. Scientists say deer are voraciously eating Pando's new sprouts, preventing the clone from regenerating. It could deteriorate beyond recovery in less than 20 years, they warn. (Al Hartmann | The Salt Lake Tribune) At 106 acres, Pando is the largest known aspen clone, and the most massive living thing known on earth. Its trees are united by a single root system. Scientists say deer are voraciously eating Pando's new sprouts, preventing the clone from regenerating. It could deteriorate beyond recovery in less than 20 years, they warn. (Al Hartmann | The Salt Lake Tribune) At 106 acres, Pando is the largest known aspen clone, and the most massive living thing known on earth. Its trees are united by a single root system. Scientists say deer are voraciously eating Pando's new sprouts, preventing the clone from regenerating. It could deteriorate beyond recovery in less than 20 years, they warn. (Al Hartmann | The Salt Lake Tribune) At 106 acres, Pando is the largest known aspen clone, and the most massive living thing known on earth. Its trees are united by a single root system. Scientists say deer are voraciously eating Pando's new sprouts, preventing the clone from regenerating. It could deteriorate beyond recovery in less than 20 years, they warn. (Al Hartmann | The Salt Lake Tribune) At 106 acres, Pando is the largest known aspen clone, and the most massive living thing known on earth. Its trees are united by a single root system. Scientists say deer are voraciously eating Pando's new sprouts, preventing the clone from regenerating. It could deteriorate beyond recovery in less than 20 years, they warn. (Al Hartmann | The Salt Lake Tribune) At 106 acres, Pando is the largest known aspen clone, and the most massive living thing known on earth. Its trees are united by a single root system. Scientists say deer are voraciously eating Pando's new sprouts, preventing the clone from regenerating. It could deteriorate beyond recovery in less than 20 years, they warn. (Al Hartmann | The Salt Lake Tribune) At 106 acres, Pando is the largest known aspen clone, and the most massive living thing known on earth. Its trees are united by a single root system. Scientists say deer are voraciously eating Pando's new sprouts, preventing the clone from regenerating. It could deteriorate beyond recovery in less than 20 years, they warn. (Al Hartmann | The Salt Lake Tribune) At 106 acres, Pando is the largest known aspen clone, and the most massive living thing known on earth. Its trees are united by a single root system. Scientists say deer are voraciously eating Pando's new sprouts, preventing the clone from regenerating. It could deteriorate beyond recovery in less than 20 years, they warn. (Al Hartmann | The Salt Lake Tribune) At 106 acres, Pando is the largest known aspen clone, and the most massive living thing known on earth. Its trees are united by a single root system. Scientists say deer are voraciously eating Pando's new sprouts, preventing the clone from regenerating. It could deteriorate beyond recovery in less than 20 years, they warn. (Al Hartmann | The Salt Lake Tribune) At 106 acres, Pando is the largest known aspen clone, and the most massive living thing known on earth. Its trees are united by a single root system. Scientists say deer are voraciously eating Pando's new sprouts, preventing the clone from regenerating. It could deteriorate beyond recovery in less than 20 years, they warn. (Al Hartmann | The Salt Lake Tribune) At 106 acres, Pando is the largest known aspen clone, and the most massive living thing known on earth. Its trees are united by a single root system. Scientists say deer are voraciously eating Pando's new sprouts, preventing the clone from regenerating. It could deteriorate beyond recovery in less than 20 years, they warn. (Al Hartmann | The Salt Lake Tribune) At 106 acres, Pando is the largest known aspen clone, and the most massive living thing known on earth. Its trees are united by a single root system. Scientists say deer are voraciously eating Pando's new sprouts, preventing the clone from regenerating. It could deteriorate beyond recovery in less than 20 years, they warn. (Al Hartmann | The Salt Lake Tribune) At 106 acres, Pando is the largest known aspen clone, and the most massive living thing known on earth. Its trees are united by a single root system. Scientists say deer are voraciously eating Pando's new sprouts, preventing the clone from regenerating. It could deteriorate beyond recovery in less than 20 years, they warn. (Al Hartmann | The Salt Lake Tribune) At 106 acres, Pando is the largest known aspen clone, and the most massive living thing known on earth. Its trees are united by a single root system. Scientists say deer are voraciously eating Pando's new sprouts, preventing the clone from regenerating. It could deteriorate beyond recovery in less than 20 years, they warn. (Al Hartmann | The Salt Lake Tribune) At 106 acres, Pando is the largest known aspen clone, and the most massive living thing known on earth. Its trees are united by a single root system. Scientists say deer are voraciously eating Pando's new sprouts, preventing the clone from regenerating. It could deteriorate beyond recovery in less than 20 years, they warn. (Al Hartmann | The Salt Lake Tribune) At 106 acres, Pando is the largest known aspen clone, and the most massive living thing known on earth. Its trees are united by a single root system. Scientists say deer are voraciously eating Pando's new sprouts, preventing the clone from regenerating. It could deteriorate beyond recovery in less than 20 years, they warn. (Al Hartmann | The Salt Lake Tribune) At 106 acres, Pando is the largest known aspen clone, and the most massive living thing known on earth. Its trees are united by a single root system. Scientists say deer are voraciously eating Pando's new sprouts, preventing the clone from regenerating. It could deteriorate beyond recovery in less than 20 years, they warn. Logan • A new study finds a Utah aspen grove considered the world’s largest living organism is continuing to decline despite new fencing designed to keep out mule deer whose appetites are blamed for its deterioration. The Logan Herald Journal reports that two Utah State University professors found that some fencing constructed in 2013 is keeping the deer from eating the trees, but additional barriers put up in 2014 don’t seem to have protected the colony known as Pando, located in Fishlake National Forest. Utah State extension professor Darren McAvoy says that's likely because falling trees have knocked over the fence, allowing the deer back inside. The grove originated from a single seed hundreds or even thousands of years ago, and now consists of over 40,000 genetically identical trees that share one root system.